The Battle of Tolvajärvi ['tol.va.jær.vi] was fought on 12 December 1939 between Finland and the Soviet Union. It was the first large victory for the Finns in the Winter War. 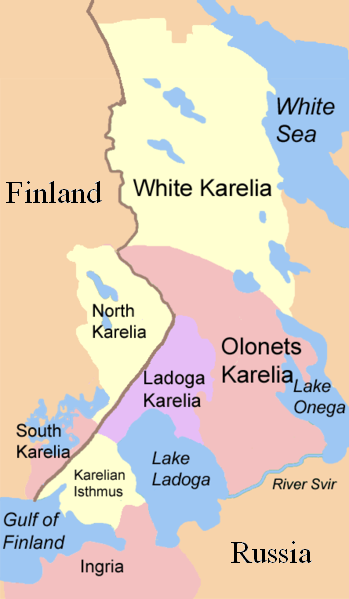 After the Winter War broke out on November 30, the Finnish troops north of Lake Ladoga began a pre-planned retreat before the overwhelming opposition. 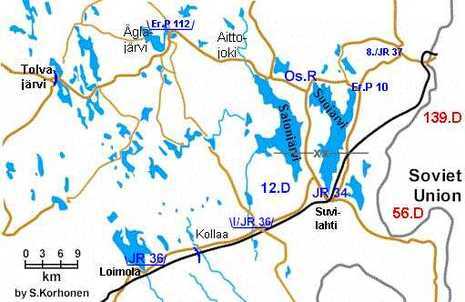 It was not thought possible for the Soviets to deploy large number of troops in this rugged and almost roadless area, but the Soviets deployed an entire division which advanced along the road between Suojärvi and Tolvajärvi (now Tolvayarvi, Russia). The Soviet advance was a serious threat to the Finnish IV Corps' lines of communication. 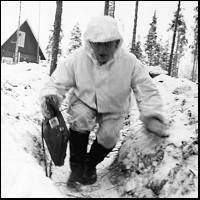 To counter this threat the Finnish high command assembled "Group Talvela" commanded by Colonel Paavo Talvela. The objective of the attack was simple, encircle and destroy as many units of the 139th division as possible. As the strength favored the Soviets, the attack was planned to be a flanking attack from the north, sending a strong reconnaissance force from the south, leaving a strong reserve to exploit any success. A new task force was formed from two battalions, with the mission to attack across the northern end of Lake Hirvasjärvi. It was designated Task Force Malkamäki (Os. M in the map), and it was consisted of Er.P 9 and I/JR 16.